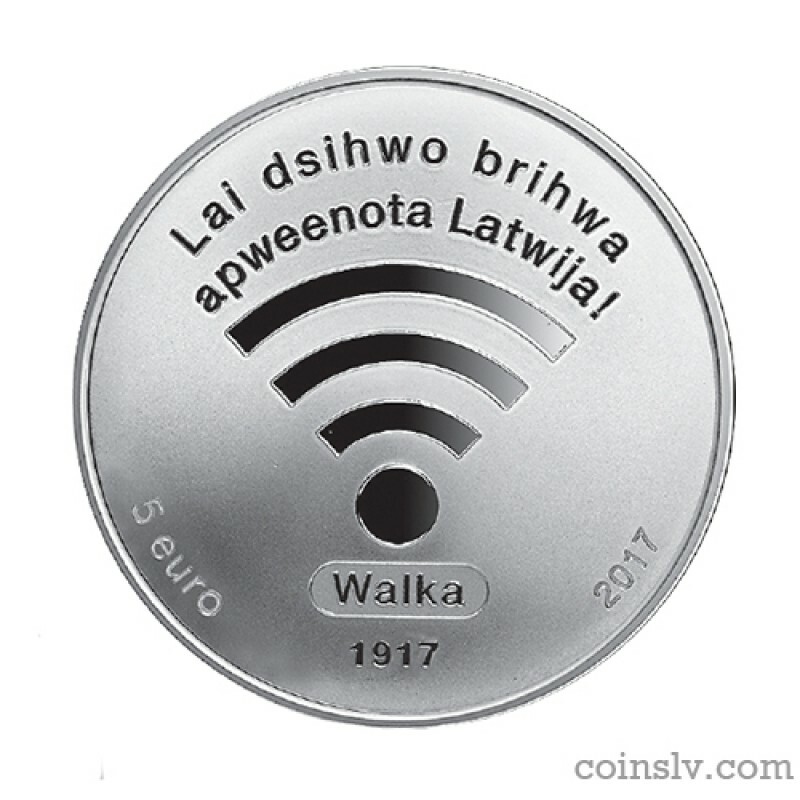 Latvia 5 euro 2017 "The First session of LPNC"
A Wi-Fi symbol is featured in the centre, with an inscription "Long live the free and united Latvia!" arranged in two lines in a semi-circle above it. 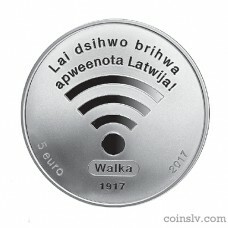 An inscription "Walka" is featured below the symbol, with the year 1917 placed below that. An inscription "5 euro" is placed in the bottom left part of the coin in a semi-circle, with the inscription of the year 2017 placed to the right. An extract from the Latvian Provisional National Council's appeal "To all Latvians!" in its historical spelling is featured in the centre, arranged in a spiral, starting from the rim: "The great call for liberation has resounded: we call for self-determination for all nations! Do not wait for any other liberation! Take the chance that the history offers you and be ready to clear foreign oppressors from your doorway! Take for yourself this land that our fathers have gained with their blood and sweat and toil and build there a better state with more justice than the one which is collapsing now." 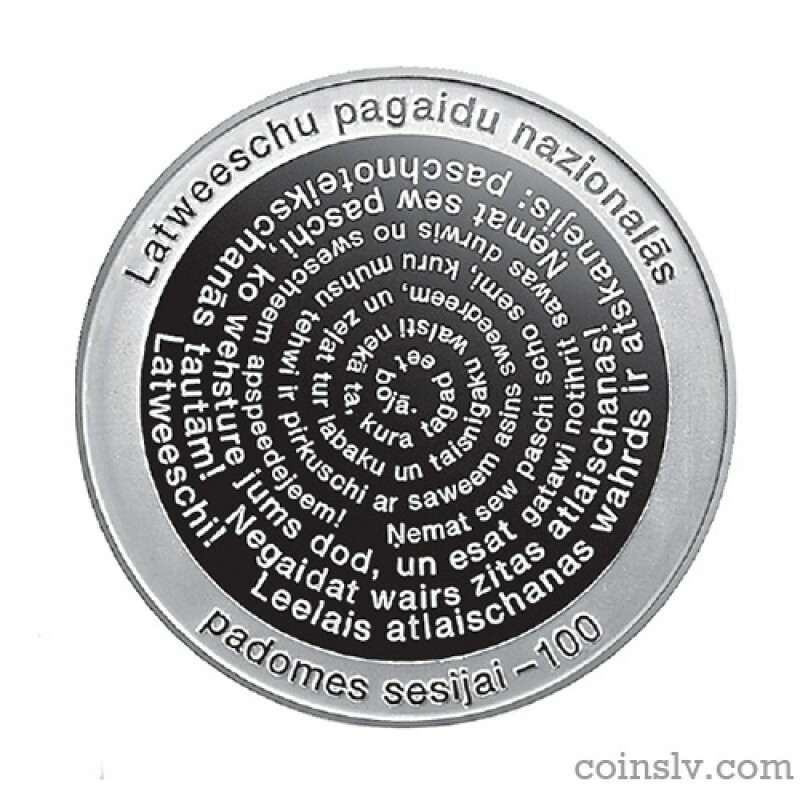 An inscription "Latveeschu pagaidu nazionalās" (Latvian Provisional National) is semi-circled at the top, whereas an inscription "padomes sesijai – 100" (Council's session – 100) is placed in a semi-circle at the bottom. The darkest hour is just before the dawn – we could say that about the situation of the Latvian nation in November 1917. At that moment, the territory of the present-day Latvia had been split by the battle-front of World War I already for more than two years and hundreds of thousands of its inhabitants – refugees from Kurzeme and Zemgale, workers of the plants evacuated from Riga, those mobilised in the army – were scattered across the vast territory of the Russian Empire. In September 2017, the German troops captured Riga and plans to annex and Germanize the occupied Baltic territories were designed in Berlin. In Russia, following a year of political turmoil, a new radical force – the left-wing Social Democrats or Bolsheviks – had seized power by way of an armed coup d'état. The huge country was falling fast into the chaos of the civil war. Valka was the city with the largest number of Latvians in the territory of Latvia not occupied by Germany. After the fall of Riga to the German forces, it became the centre of Latvian social, political and cultural life. Those united by the desire to turn into reality the right of self-determination of the Latvian nation assembled in Valka. On 16–19 November (29 November–2 December, New Style) 1917, the first session of the Latvian Provisional National Council (LPNC) was held in Valka, with representatives of almost all major Latvian organisations and political parties taking part: former deputies of Russia's State Duma Jānis Goldmanis (1875–1955) and Jānis Zālītis (1874–1919); future statesmen of Latvia Zigfrīds Anna Meierovics (1887–1925), Voldemārs Zāmuēls (1872–1948), Ādolfs Klīve (1888–1974) and Francis Trasuns (1864–1926); writers Jānis Akuraters (1876–1937), Kārlis Skalbe (1879–1945) and Edvarts Virza (1883–1940); philosopher Pauls Zālīte (1864–1939) et al. Latvian Social Democrats who had the real power in Vidzeme distanced themselves from the Council's work. In its appeal "To all Latvians!" the Council stated: "The great call for liberation has resounded: we call for self-determination for all nations! Do not wait for any other liberation! Take the chance that the history offers you and be ready to clear foreign oppressors from your doorway! Take for yourself this land that our fathers have gained with their blood and sweat and toil and build there a better state with more justice than the one which is collapsing now." The LPNC also issued a declaration "To countries and nations abroad" stating the following: "Latvia, comprising Vidzeme, Kurzeme and Latgale, is an autonomous sovereign entity; its position, foreign affairs and home affairs will be defined by its Constitutional Assembly and a national plebiscite." Thus a powerful and explicit signal about the desire of the Latvian nation to have a sovereign state was sent from Valka. However, the situation at that point was not favourable for its full implementation. The following year the LPNC continued its work towards Latvia's independence, even when the German forces occupied the entire territory of Latvia, but the Bolshevik regime in Russia increasingly blocked the Council's work. In summer 2018, Zigfrīds Anna Meierovics, the representative of the LPNC, went to Western Europe to confirm the desire of the Latvian nation to have a sovereign state to the potential winners of World War I; it was not long before the latter had to decide about the new order in post-war Europe. The statement of the British government, received a week before the proclamation of Latvia's statehood and recognising the LPNC to be the Provisional Government of Latvia until the establishment of the new state de facto, was a very important argument in the international context in favour of establishing Latvia's statehood. Declaration of independent Republic of Latvia in Riga on 18 November 1918 finalised the course clearly outlined a year ago in Valka. 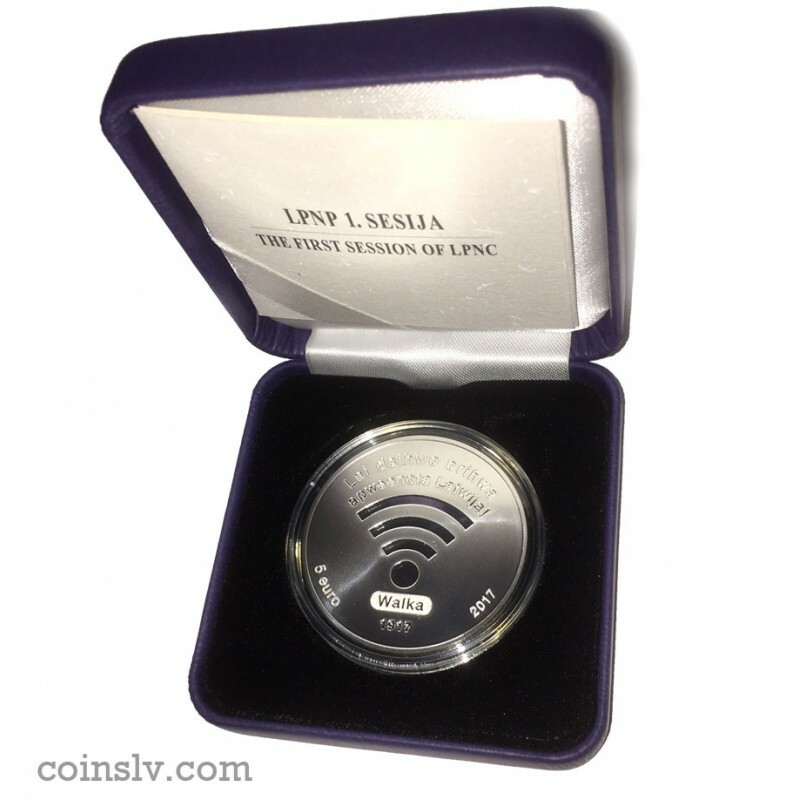 The first session of the LPNC was a significant event towards establishing Latvia's statehood; therefore, Latvijas Banka has issued a collector coin dedicated to its 100th anniversary.